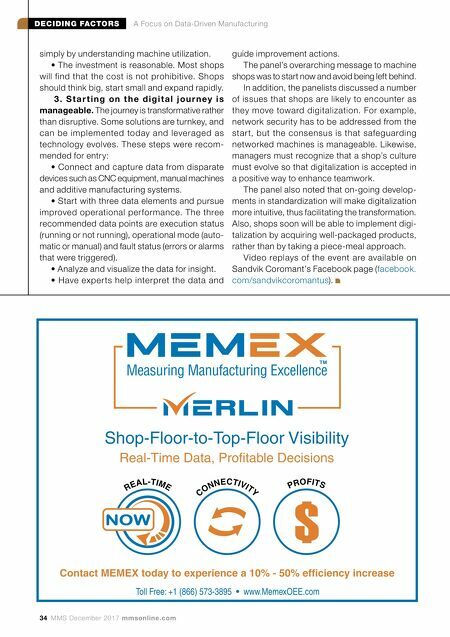 34 MMS December 2017 mmsonline.com DECIDING FACTORS A Focus on Data-Driven Manufacturing simply by understanding machine utilization. • The investment is reasonable. Most shops will find that the cost is not prohibitive. Shops should think big, start small and expand rapidly. 3 . S t a r t i n g o n t h e d i g i t a l j o u r n e y i s manageable. The journey is transformative rather than disruptive. Some solutions are turnkey, and can be implemented today and leveraged as technology evolves. These steps were recom- mended for entry: • Connect and capture data from disparate devices such as CNC equipment, manual machines and additive manufacturing systems. • Start with three data elements and pursue improved operational per formance. The three recommended data points are execution status (running or not running), operational mode (auto- matic or manual) and fault status (errors or alarms that were triggered). • Analyze and visualize the data for insight. • Have exper ts help interpret the data and guide improvement actions. 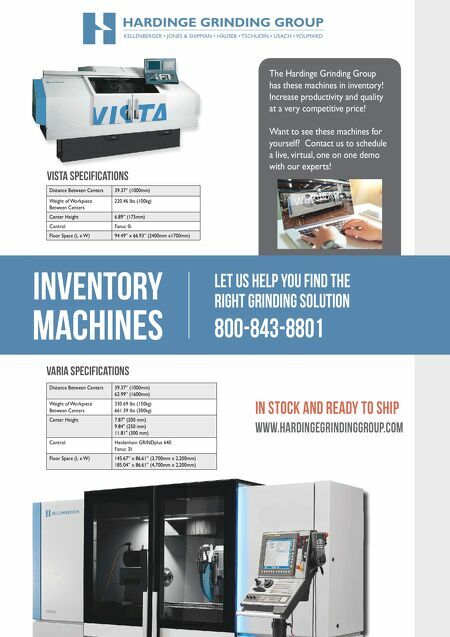 The panel's overarching message to machine shops was to start now and avoid being left behind. In addition, the panelists discussed a number of issues that shops are likely to encounter as they move toward digitalization. For example, network security has to be addressed from the star t, but the consensus is that safeguarding networked machines is manageable. Likewise, managers must recognize that a shop's culture must evolve so that digitalization is accepted in a positive way to enhance teamwork. The panel also noted that on-going develop- ments in standardization will make digitalization more intuitive, thus facilitating the transformation. Also, shops soon will be able to implement digi- talization by acquiring well-packaged products, rather than by taking a piece-meal approach. Video replays of the event are available on Sandvik Coromant's Facebook page ( facebook. com/sandvikcoromantus ).